> number of times. You’ve never answered it. Actually this question has been answered by the pals of Jochen a few centuries ago. And Jochen will not answer this because his motive is “Inter-Faith Dialogue”. But let me help Jochen and others out of this “Inter-Faith Dialogue”. Most of us may not have heard the word Maometis derived from Mahomet. the word Maometis means The number of the beast, i.e., 666 stuff . When the Christian polemics started a few centuries ago strong vituperative language was poured out upon Muhammad(P) headed by Maracci, Prideaux and others. The word Mahoun and Mahound means Muhammad, imagined in the middle ages to be a pagan God. In Scottish this word means the devil. Of all the world’s greatest men none has been so much maligned as Muhammad. It is easy to see how this has come about. For centuries Islam was the great enemy of Christendom, for Christendom was in direct contact with no other organized states comparable in power to the Muslims. The Byzantine empire, after losing its provinces in Syria and Egypt, was being attacked in Asia Minor, while Western Europe was threatened through Spain and Sicily. Even before the Crusades focused attention on the expulsion of the Sarcens from the Holy Land, medieval war-propaganda, free from the restraints of factuality was building up a conception of ‘the great enemy’. At one point Muhammad was transformed into Mahound, the prince of darkness. By the eleventh century the idea about Islam and Muslims current in the crusading armies were such travesties that they had a bad effect on morale. 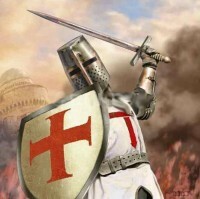 The crusaders had been led to expect the worst of their enemies, and, when they found many chivalrous knights among them, they were filled with distrust for the authorities of their own religion. Coming back to the modern age, we will still find Christians like Jochen calling the Prophet(P) Child Molester although in a politically correct language. Go to Hyde Park Speakers’ Corner (London, UK) on Sunday and you will find Christian fundamentalists calling Allah, the Moon god and repeating the same age old polemics like the Prophet(P) was a Child Molester, a Keeper of Harem and an anti-Christ. Basically, nothing has changed from then till today. The “Crusades” are still there although wrapped up in a deceptive way. So do not get fooled by Jochen’s “Inter-Faith Dialogue” or “Christian-Muslim Understanding”. All these are lies and damn lies. Being on the soc.religion.islam for more than two and half years, I can testify that. What do you know about prophet Mohammed peace upon him? The best commander of the world….. The best solider of the world…. The best physician of the world…. The best and the only Perfect man ok the world…. A strong man is not he who defeats his adversary by wrestling, but a strong man is he who controls himself at the time of anger. Allah and His Angles send blessings on the Prophet: O you that believe ! you send blessings on him, and salute him with all respect. Muslims believe that Muhammad (may Allah’s blessings and peace be upon him) was the final prophet of God, sent to the whole of mankind to call the people to worship The Creator alone, and show praise and gratitude to Him. The following are some proofs of his Prophethood. 1 . Muhammad (may Allah’s blessings and peace be upon him) was raised illiterate, unable to read or write, and remained like that till his death. Among all his people, he was known as being truthful and trustworthy. Before receiving revelation, he had no prior knowledge of Religion or any previously sent Message. He remained like that for his first forty years. Revelation then came to Muhammad with the Qur’an that we have in our hands today. This Qur’an mentioned most of the accounts found in the previous scriptures, telling us about these events in the greatest detail as if he witnessed them. These accounts came precisely as they were found in the Torah sent down to Moses and in the Gospel sent down to Jesus. As the enmity of persecutors increased, so did the number of the Prophets followers (May Allah be pleased with them). The Quraysh were baffled at how to stop the people from taking the Prophet peace be upon him and his teachings seriously; at how to make them hold aloof to him and thus finally disregard him. Mecca was a commercial center frequented by tribes people from far and near and during the Hajj, or when it is about to draw near, a plethora of them were to come again. The people coming to Mecca had somehow to be kept at a distance from the Prophet peace be upon him, lest they should hear his sermons and digest his words, or that they may contemplate or reflect and meditate upon them. They went to Walid Ibn Al-Mughira, who was old and a man of standing, to seek his advice. He said, O people of Quraysh, the time of Hajj has come around when delegations of the Arabs will come here. They have all heard about this man (the Prophet ), so agree upon a common ground hence you do not contradict one another and each one of you says the same thing. Different suggestions were put forward but Walid was not satisfied. At last, he was asked to suggest some way out. Thereupon he said, The most convincing thing in my opinion would be that all of you present him as a sorcerer. You should say that he has brought a message through which he creates a rift between fathers and sons, or where brothers fall out from brothers, as well as husbands part ways with their wives and that families break up under his influence. The Prophet of God peace be upon him preached Islam openly in the streets of Mecca, yet the Quraysh remained cool and indifferent to him; neither did they turn against him nor did they ever feel that their Religion was at stake. They did not even care to refute the Prophet peace be upon him but when he started talking critically of their gods, they felt offended and decided to rebuke him. Muhammad peace be upon him would have been at the mercy from the radicals of the merchants republic of Mecca, but Abu Talib, the Prophet’s uncle, continued to treat him kindly and stood up in his defense. And, the Prophet peace be upon him, equally determined to actively propagate his new faith, continued to call the people to Islam. Nothing could stop the Prophet peace be upon him from preaching the commands of his God, in the same way that nothing could also dissuade Abu Talib to waive his protection from the nephew he so loved more than his sons. The Prophet peace be upon him was born on Monday, the 12th of Rab’i-ul Awwal (1) in the year of the Elephant. Certainly, it was the most auspicious day in the history of mankind. Thus, Muhammad peace be upon him was the son of Abdullah Ibn Abdul Muttalib, Ibn Hashim, Ibn Abdul Munaf, Ibn Qusayy, Ibn Kilab, Ibn Murra, Ibn Kab Ibn Luayy, Ibn Ghalib, Ibn Fihr, Ibn Malik, Ibn al-Nadr, Ibn Kinana, Ibn Khusayma, Ibn Mudrika, Ibn Ilyas, Ibn Mudar Ibn Nizar Ibn Maadd, Ibn Adnan.